Update: December 9, 2008 – The two plagiarized poems had been deleted. Thanks to the site administrator/owner of Buzzle.com for doing me a favor. I really appreciate it. Thank you also to all who commented. This is the second time I am posting about my poems being plagiarized. For the past few days, I’ve been collecting screenshots of different sites where you can see my plagiarized poems. I will be posting them in the coming days. First in the list is my Saying Goodbye poem. Somebody copied the poem, and what’s worst, she’s claiming it’s hers. She even has the nerve to tell me she made the poem long time ago before I was born, that I was the one who took it from her because she has many poems in many places and that she has awards to prove it. Dream on, libre lang yan. Duh! I don’t care if she is the best poet around or whatever. I also have lots of awards diba Nilo? haha, tingnan sa mga tags and awards category, nyek! Seriously, I was googling my poem and was surprised to see 5 or more copycats. The other ‘offenders’ copied my poem as is, but didn’t bother to mention where they copied it from. 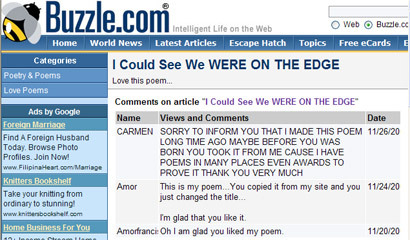 But this person who submitted her poems in Buzzle.com plagiarized my Saying Goodbye poem. She copied it, changed the title, and now claim it’s hers, ako pa ang pinapalabas na nangopya, ang kapal! I wrote Saying Goodbye on March 26, 1995 when I was 18 years old. Huwag nyo ng itanong kung bakit ko isinulat yan, haha! 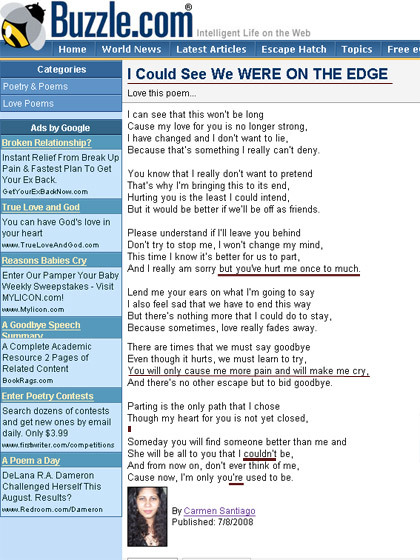 She submitted the poem on July 8, 2008 with the title “I could see we were on the edge”. But as you can see it’s more than 90% plagiarized from my poem Saying Goodbye. The underlined words are her own, while the underlined you’re is my grammatical error, which I then corrected to your in my poem. I was expecting that she would admit she copied my poem, but she did not. Talagang pinapanindigan nya na sa kanya yun, haha! So I commented again, but she or somebody else deleted it today. I should have made a screen capture last night when I was still able to read my last comment. I don’t exactly remember what I said except that I mentioned that LYING LIPS ARE ABOMINATION TO THE LORD – Proverbs 12:22; and A RIGHTEOUS MAN HATETH LYING – Proverbs 13:5. I am not being self-righteous here, I am as evil as whoever and I also lied many times before but I do NOT claim somebody else’s work! 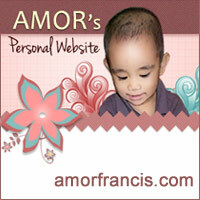 December 3, 2008 Update. I just want to add this screenshot of the same poem, but this time it has different title, I Could See We Won’t Last Long. Of course, same plagiarist pa rin, Carmen Santiago! This is bothersome. As a fellow poet, it would have been distasteful for someone to claim that the original work you made was theirs. Plagiarism is a crime either she removes it or asks permission from you to paste it at her site. Of course, without tampering any of the words. Plagiarism is the dark side of the internet. It’s difficult to do something to protect texts, poems etc. Mahirap talagang makipag usap sa site owner. Babaligtarin ka pa na ikaw ang nangopya. Or your comments will not be published. A good alternative is to contact the web host and provide them with your evidence. Web hosting is a business and it’s in their interest not tolerate being known for coddling plagiarists. A good resource on how to handle plagiarism and ways to combat them ? Jonathan Bailey has a blog – Plagiarism Today – that deals exclusively about this problem..